The Sega Game Gear was built as direct competition to Nintendo’s Game Boy. It is essentially a portable (upgraded) version of the Sega Master System, with many accessories available. There’s also a large group of developers creating new mods and software patches for the system. This section will try to provide all the information you need and keep you up to date on all new options. There were a few different versions and color options of the Game Gear. This page gives a quick rundown of the two notable versions. This page provides information about modding your Game Gear for TV-out. This page showcases McWill’s LCD screen replacement for the Game Gear. Many game modders have created some pretty amazing patches that allow you to play Game Gear roms on a Genesis or Master System. This page shows how to play SMS games on your Game Gear using an adapter. Many Game Gear games were simply Master System games converted to the lower resolution of the Game Gear. Here is a list of all the games that are only available on the Game Gear. 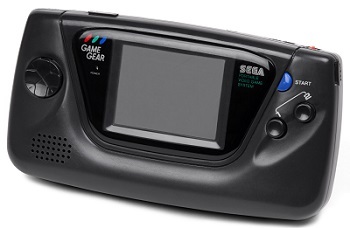 – In my opinion, the Game Gear’s screen has not aged well. I suggest either installing a replacement LCD or finding a way to play the games on a TV, either via TV-out mod or romcart / modified rom file. – If you prefer to play on the original, unmodified handheld, I recommend doing a full cap replacement. Also consider the Majesco version, as it might be a slight improvement over the original. – You can play Master System games on the Game Gear via a converter, but in my opinion the original Game Gear screen ruins the image.